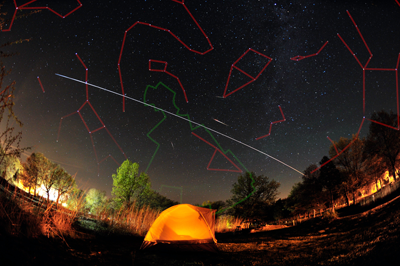 Explanation: From a camp on the northern shores of the Great Lake Erie, three short bright meteor streaks were captured in this composited night skyscape. Recorded over the early morning hours of May 24, the meteors are illusive Camelopardalids. Their trails point back to the meteor shower's radiant near Polaris, in the large but faint constellation Camelopardalis the camel leopard, or in modern terms the Giraffe. While a few meteors did appear, the shower was not an active one as the Earth crossed through the predicted debris trail of periodic comet 209P/LINEAR. Of course, the long bright streak in the image did appear as predicted. Early on May 24, the International Space Station made a bright passage through northern skies. I'm pretty sure you mean "elusive" (difficult to find) rather than "illusive" (unreal, the result of an illusion). Thank you so much, Case! I like the APOD, too. I remember back in the 1950's how enthralling it was to look up at the contrails of the early jets. Now contrails intrude on nearly every sunset and skyscape. Today's APOD struck me as a prelude to the possibility that someday it will be hard to stare at the night sky without the intrusion of dozens if not thousands of irritating little dots scampering across the night sky. logmark wrote: I remember back in the 1950's how enthralling it was to look up at the contrails of the early jets. Now contrails intrude on nearly every sunset and skyscape. Today's APOD struck me as a prelude to the possibility that someday it will be hard to stare at the night sky without the intrusion of dozens if not thousands of irritating little dots scampering across the night sky. At times and places, contrails today are driving weather and climate effects. Some climate models actually take into consideration the significant impact of contrails. Chris Peterson wrote: At times and places, contrails today are driving weather and climate effects. 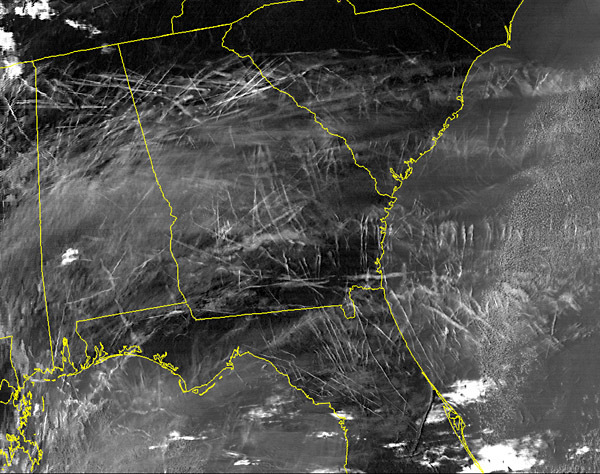 Some climate models actually take into consideration the significant impact of contrails. Any climate model that still doesn't take contrails into effect would be very obsolete IMO. Look at how much sunlight is being blocked from reaching the Earth's surface in the image Chris provided. Those white contrail clouds are reflecting a lot of energy back out into space. I remember reading that in the days following 9-11 when all air traffic was grounded across the US the daytime average temperatures here went up by a messurable amount. This showed that air traffic is having a global cooling effect, and that without this offsetting effect global warming would be worse than it currently is.